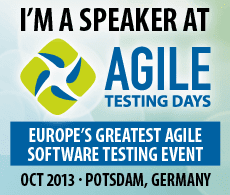 ← How about an agile talk instead of a talk about agile? I am using above mentioned process from couple of years and it really works. Thanks for your feedback Sunil, great to hear it is working for you! Thanks for your feedback Dimpy. I discovered that when we introduce empathy and true listening the people we talk to tend to show more interest. This does not happen always and at the same time, some people immediately bond and grow interested in our ideas, some others require longer and some never really do. Remote working mode can make this more difficult, occasional travel to meet face to face for a week or so and use of highly collaborative tools like slack, skype and other often help. Thanks for your feedback Ruma, if you speak to your testers and see what they do to influence the team, I’d delighted to know new ways! Thanks for your feedback James. I agree, pairing is the best way of building a good working rapport. It is important to pair with respect, i.e. listen deeply and contribute for the best of the pair leaving out our personal goals.